Through a horrific half-century of decline, Detroit has become one of the most blighted cities in America. It has also become one of the most misunderstood — a victim of misread history, media clichés, self-serving racial rhetoric, corporate and political indifference, and crime and corruption that can still get downright rococo. But lately there have been encouraging signs that people are starting to get Detroit, a necessary first step if the hoped-for renaissance is to take place. Not only do these people understand what the city means and what happened to it, but they’re able to believe that the city has a future beyond bankruptcy, abandonment, and physical decay. There is not a Pollyanna or a Romantic in this crowd. Nor is there anyone willing to succumb to despair. They’re a reminder that Detroiters are, first and last, survivors. Then there was Paul Clemens’s 2005 memoir, Made In Detroit, which tells what it was like to grow up white in a city that became predominantly black in 1973, the year Clemens was born, the year Young was elected the city’s first black mayor. Among the book’s many insights is that Detroit has always been a raw place, no matter what color your skin happens to be or who happens to be in charge. He invokes Louis-Ferdinand Céline’s Journey to the End of the Night: “After leaving behind World War I battlefields, Paris slums, and malarial African jungles, Céline’s restless narrator makes his way to the Motor City, to work in the Ford factory. At the beginning of the first Detroit chapter, he says, in an observation yet to be improved upon: ‘It was even worse than everywhere else.’” And that was in the 1920s, when the city was booming. The latest addition to this growing body of wised-up writing is a scintillating new collection called A Detroit Anthology, published by Rust Belt Chic Press (which has also brought out companion volumes about Cleveland and Cincinnati). It’s a lively stew of reportage, poetry, memoir, photography, personal essays, and fictionalized observation. There is no cheap nostalgia or breathless boosterism. There are remarkably few mentions of cars, but plenty of talk about sports, race, families, neighborhoods, music, and history. In fact, the book’s greatest strength is the various ways the contributors acknowledge that understanding Detroit’s history is the key to understanding its current condition and its possible ways forward. In Detroit, more than most places, the past will never be past. This much everybody understood, and it formed the basis for an uneasy alliance — they needed each other too much to let their mutual dislike get in the way. But as always in these types of things, it was more complicated than that. The neighborhood black community was made up of my father’s friends and enemies. They were the source of his livelihood and the bane of his existence. When flames and rage engulfed the city in July of 1967, many black merchants spray-painted badges on their buildings — SOUL BROTHER and AFRO ALL THE WAY — in the hope that arsonists would pass them by. Sometimes they did, sometimes they didn’t. In any event, the Jewish hardware store on Gratiot remained untouched, for reasons that will never be known. “My father attributed this to his good relations with the black community,” Pomerantz writes, “but it could have been just dumb luck.” In a bitter irony, the business failed not because of racism or crime or white flight, but because Pomerantz’s uncle spent years embezzling money from his own brother. The contributors to A Detroit Anthology range from first-time authors to seasoned professionals, which gives the collection its free-wheeling, anything-goes feel. But it’s not flawless. In the essay “I’m From Detroit,” Shannon Shelton Miller writes scornfully about how suburbanites (that is, white people) know virtually nothing about the city or the people who live there (that is, black people). There’s some truth to the point, but it’s part of the tired old merry-go-round that helped bring Detroit low in the first place. It comes out of territoriality, provincialism, tribalism. It’s about us vs. them, and in Detroit there’s an almost laughable abundance of such dividing lines: city vs. suburbs; black vs. white; labor vs. management; Republican vs. Democrat; foreign vs. domestic; even west side vs. east side. To Miller’s way of thinking, 8 Mile Road is the great line in the sand, the DMZ between the city and its northern suburbs, between the courageous few who chose to stay and the multitudes who opted to flee. But as Steven Pomerantz knows, it’s more complicated than that. I have lived north of 8 Mile and I have lived south of 8 Mile – I have lived all over the world, for that matter – and I can report that vice and virtue have nothing to do with geography or race. Zip codes and skin color confer nothing. This harping on geography — and its subtexts — reminds me of a common encounter I had when I lived in the South. When Southerners heard my flat Midwestern accent — no syrup, no drawl — they often asked a question that was not altogether friendly: “Where you from, anyway?” The subtext was obvious: You’re not one of us, so you’re automatically suspect. Asking me where I was from was the wrong question. The right question would have been: What are you made of? Or better yet: What’s in your heart? Rather than create simple works of historical fiction, fashioning narratives set solely in war-ravaged Europe, Ullman, like Chabon and Foer, has ushered in a fecund new phase of Holocaust fiction. It is not only necessary that we try to recapture the morally-starved world of the actual Holocaust, but that we take up the question of how much that bleak history should define our present-day lives. 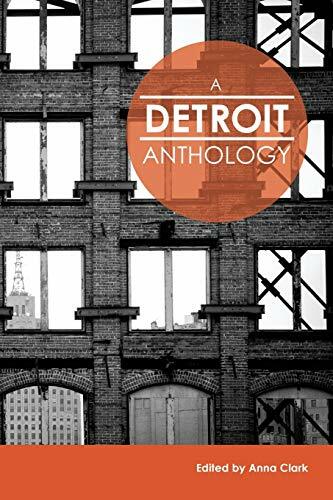 Thank you for your kind words regarding my essay in your review of A Detroit Anthology. I am glad the book was reviewed by a native of Detroit, who understands there were no innocents in, or simple explanations of, it’s demise. at least two the contributors you mention–Steve Pomerantz and Kat Harrison–are making their writing debuts in this book. Incredible the talent previously untapped: previously untold stories indeed.